Back on the topic of recording the boys’ games. As I mentioned in my post “Follow Up on Doubling Up”, I was trying to find a resolution to a couple of challenges with recording volleyball matches when the boys are playing at the same tournament. This weekend will present another situation where I will be doing my best to be in two places at the same time throughout the day. But luckily I am better prepared this time. As I mentioned in the last post, I love my Manfrotto tripod and video head combination. It is solid and great for recording soccer games and volleyball. Whether I am on the roof of the press box recording soccer or the stands in the gym shooting volleyball, it is the right stand for the job. But as I mentioned, it is big and needs a decent footprint to provide its stability. Volleyball tournaments at a multi-court venue get crowded. Typically a court hosts 4 teams. Assuming each team has 10 players, give or take, you have 20 kids involved in playing, most of another 10 involved in working the game (referees, line judges, scoring table, etc. ), then 10 kids who are “sitting” (neither working nor playing). Add in a parent per kid (make it 1.5 since most kids have two fans on the sidelines) and you can have 100 people around a 60 X 30 court. It is not uncommon for those watching one court to be literally back to back with people watching the adjacent court. Space is a commodity. Last year at the East Coast Championships they banned tripods. The tournament is held here in Richmond at the Convention Center where there are 60 or more courts setup. The volume of noise is almost deafening (you don’t realize how chaotic the constant whistles are until you walk out after a day of them) and it is impossible to escape the crowds. Those videoing the games, like me, try to find space in a corner (avoiding the marked walkways where you aren’t allowed to stand and keeping off the court surface where the refs will force you to back off in a not always gentle tone) and make the most of it. I never saw anyone enforce the tripod ban, some people used them with a minimal spread, but it is coming. With an eye on space savings and mobility to get from one court to another when the boys are playing on the same day, I started researching monopods. 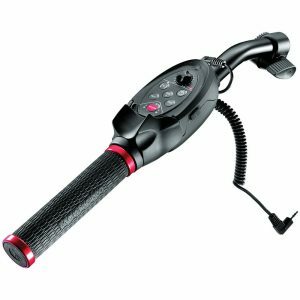 The Manfrotto products have impressed me with their quality and thoughtfulness – they just seem to think of the little extras in everything they design. Through my research I kept the Manfrotto options in my consideration and basically compared other options against them. 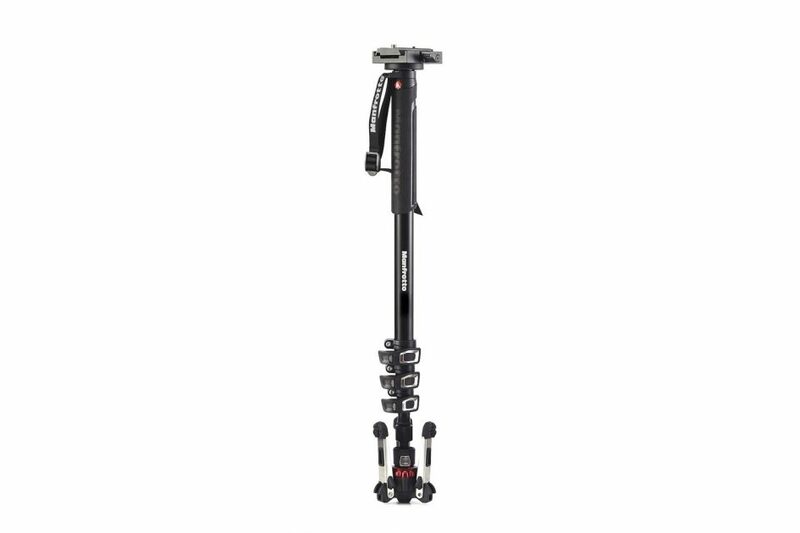 Ultimately I went with the Manfrotto X-Pro Aluminum 4 US. I was tempted by the carbon fiber version but the aluminum model was not that much heavier and extended a little taller. 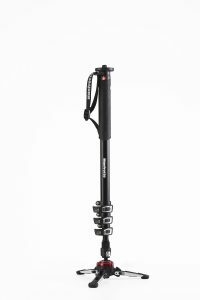 The key points for the monopod included the clips which allow easy adjustment and locking at different heights. It also has three legs that extend at the bottom to help stabilize it (although as all reviewers will tell you, don’t trust them to be stable enough to walk away from it with any weight on the top). It also has a lockable joint at the bottom so you can lock it to be more stable or unlock to get some “lean” to it that provides plenty of sway to change your point of view. Finally the mount on the top provides the two standard screw sizes so you can put a camera right on it or mount a video head. The first use of the monopod was recording a futsal game. I mounted the camera directly on the monopod and used the unlocked joint at the bottom to pan up and down. It worked well although it took a while to get use to. I am accustomed to being able to let go of the camera on my tripod and hae it stay still. Obviously that was not an option. I felt like I was moving the camera a lot with the monopod but when I edited the video it seemed very stable (or at least between the camera stabilization and the software assistance, it came out very stable). I struggled with being able to pan low, when the ball was right in front of me, but that wasn’t a major issue. The next foray was volleyball. I really appreciated the small footprint and as part of that, I decided to downgrade my bag and “stuff” to try to see how light I could go. I was able to streamline well and established the “indoor/volleyball” equipment list that met all my needs (camera, monopod, batteries – that was about it). With the tripod I am able to mount a nice 7 inch screen and use different mic options but for a trimmed down version, I neglected the luxuries and it worked very well (and will be nice for East Coast Championships this year). I still struggled with panning down to try to catch the ball when it got closer to me. The only complaint now is with my lanc remote. 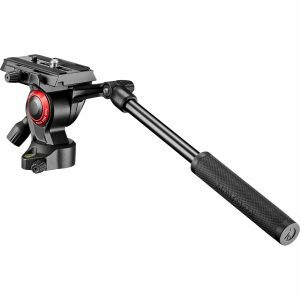 I am used to using the Manfrotto RC Pan Bar – this was what got me into using Manfrotto products originally – but it doesn’t mount well on the Bee Free video head and goes against the lightweight approach for the monopod. So I took a step backwards and am using a clamp on lanc remote (not Manfrotto) that works fairly well. The zoom is not very smooth at times and it isn’t as responsive as the Pan Bar model. The workaround is to use the zoom controls on the camera but at times that seems to require a third hand. So this weekend will be the true test. This is the first time I have been in a position to try to hop between courts to get as much of both of the boys’ teams when they overlap. With the lightweight setup I feel good about being able to move around and squeeze into whatever opening in the crowd I can find. That combined with my other resolution may have me in a position to get all of the matches captured – more on that second trick in my next post.